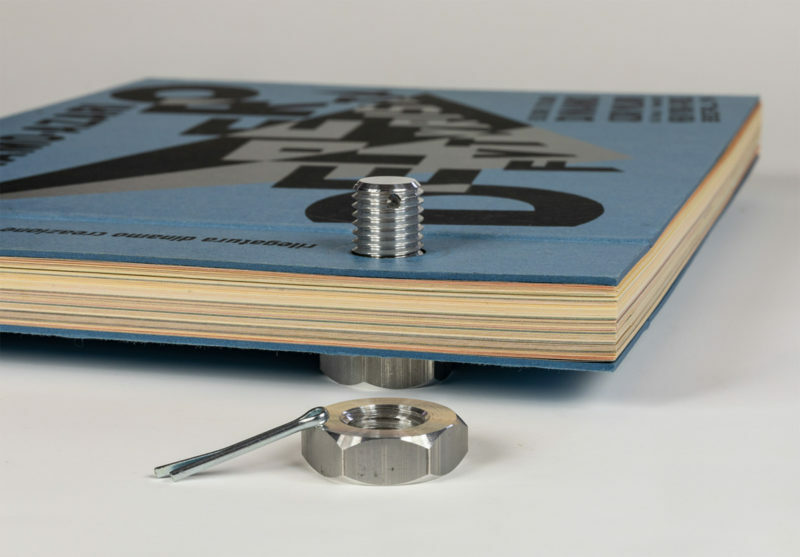 January 18, 2019 (New York) — Designers & Books is launching a Kickstarter on February 4 for a second printing of its acclaimed facsimile of Depero Futurista (Depero the Futurist) — “The Bolted Book.” After its publication in 2017, the facsimile sold out quickly, prompting many requests to reissue it. 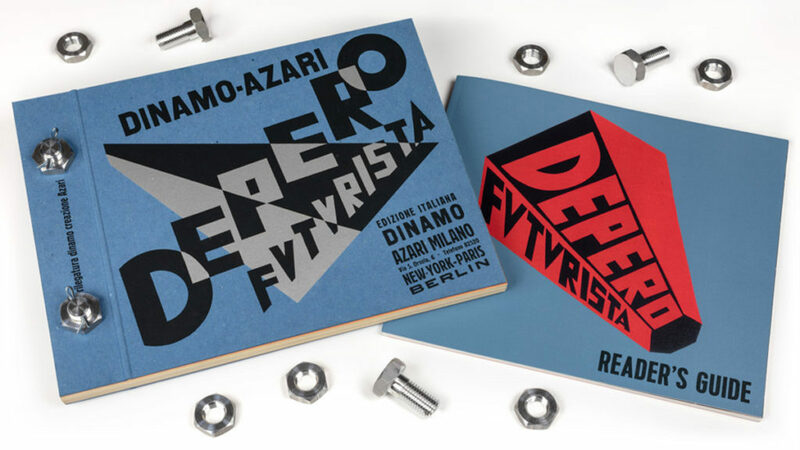 Originally published in 1927, Depero Futurista is recognized as the first modern-day artist’s book. The Museum of Modern Art in New York has called it “an avant-garde masterpiece.” Known as The Bolted Book because of its famous binding using two aluminum industrial bolts, Depero Futurista is a visual tour de force filled with groundbreaking typographic experiments and innovative explorations in nearly every art and design medium, including advertising and the form of the book itself. 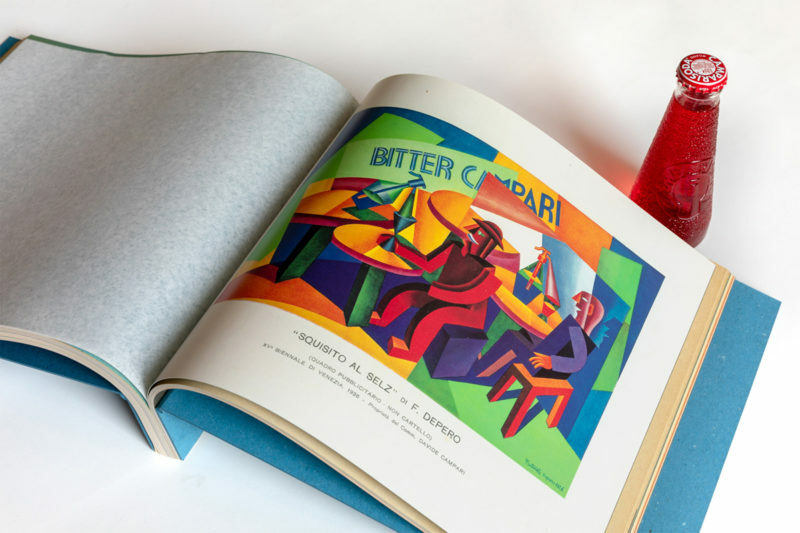 Conceived as a limited edition by the Italian Futurist designer and artist Fortunato Depero, the book was created as both a showcase for Depero’s work and a platform for his iconoclastic ideas. These ideas anticipated, by close to 100 years, a cross-disciplinary approach to design- and art-making that can be seen everywhere today. Before artists like Andy Warhol blurred the lines between commercial and fine art, Fortunato Depero (Trento, Italy, 1892–1960) created The Bolted Book. A painter, sculptor, and graphic artist, who also produced textiles, furnishings, exposition pavilions, theater props, sets for dance, and children’s toys, Depero by 1913 had embraced the modernist movement Futurism, which was marked by a love of the new century’s machine-driven technology and “dynamic” motion (represented by cars, trains, and airplanes), coupled with a forceful rejection of past traditions and institutions. With painter Giacomo Balla, in 1915 Depero authored the manifesto “Futurist Reconstruction of the Universe” – whose aim was to re-envision, and re-design, every aspect of the world to make it more exhilarating, to fuse life with art. 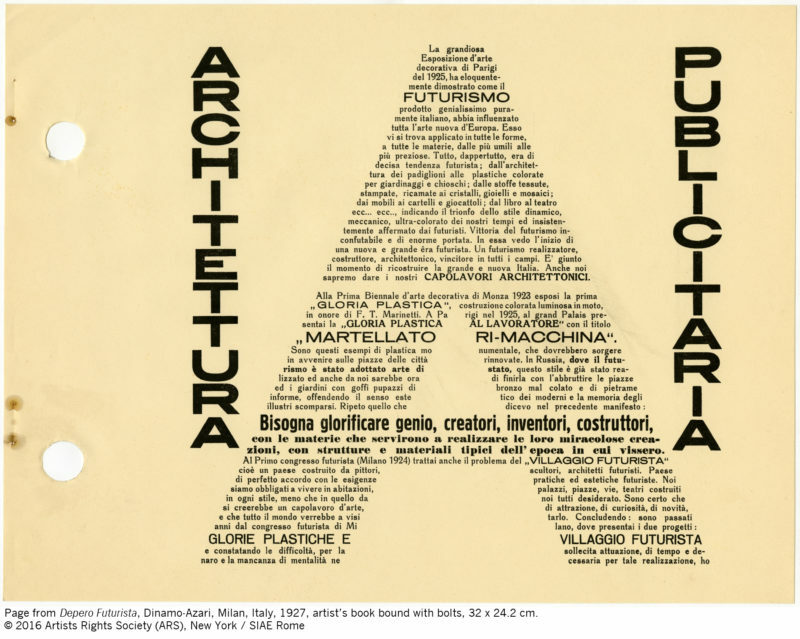 Depero Futurista, or The Bolted Book, summed up Depero’s attempt, over the next decade and a half, to do exactly that, challenging the very structure of the book at the same time. 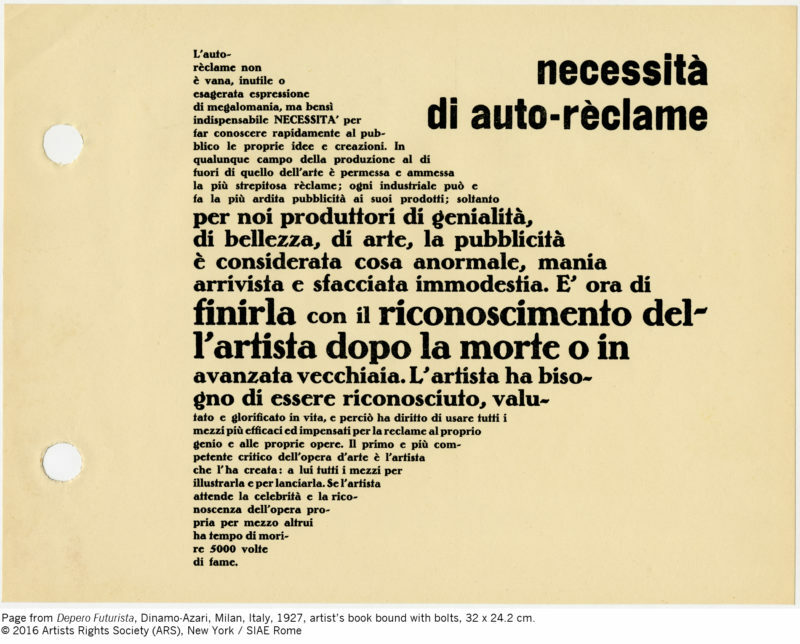 Published in Milan in 1927 by the painter-aviator Fedele Azari, who on an introductory page described it as “a mechanical book bolted down like an engine,” the book was dubbed “a typographical racing car” by Futurism’s founder, F. T. Marinetti. Included were reproductions of Depero’s drawings, paintings, and sculptures, as well as photographs of exhibition installations of his work, sketches of costumes for the first ballet without human dancers, designs for pillows, and numerous statements, reviews, and manifestos. 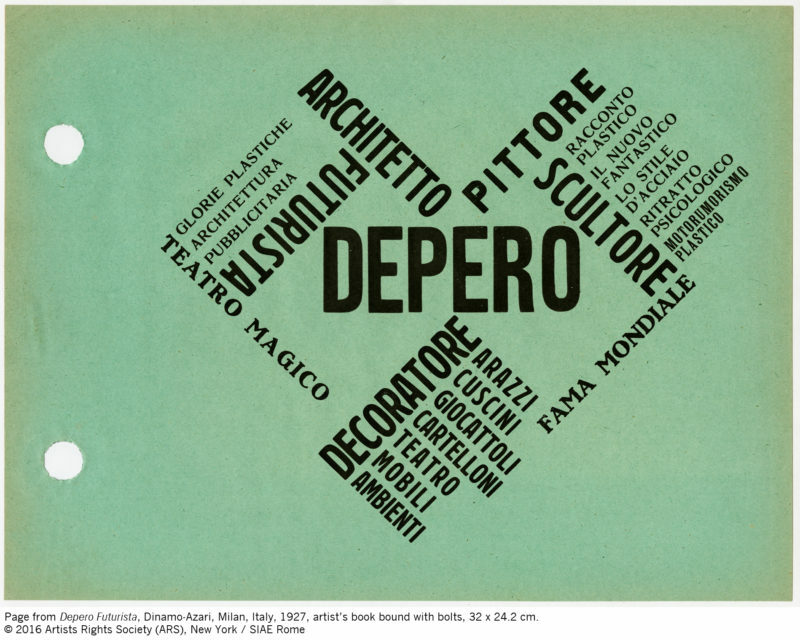 The book in particular highlights Depero’s work in graphic design and typography, including his well-known advertisements for the Italian apéritif Campari, logos, and his “visual-verbal” experiments with type, which aimed to liberate language from conventional rules. 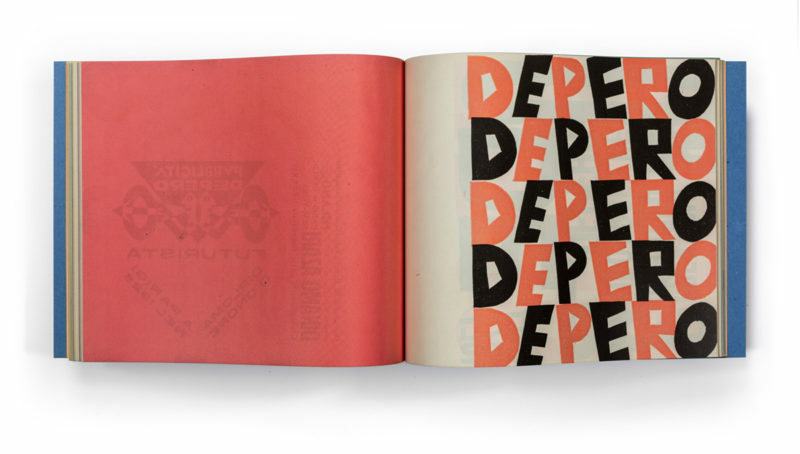 Depero took The Bolted Book with him on his first trip to New York in 1928, where it served as a business card for securing design work and also as a “portable museum” (when the bolts were removed, the pages could be pinned up on a wall, exhibition style). He was the only Futurist ever to live in New York City and while there, he produced graphic designs and covers for publications such as Vogue, Vanity Fair, and The New Yorker. 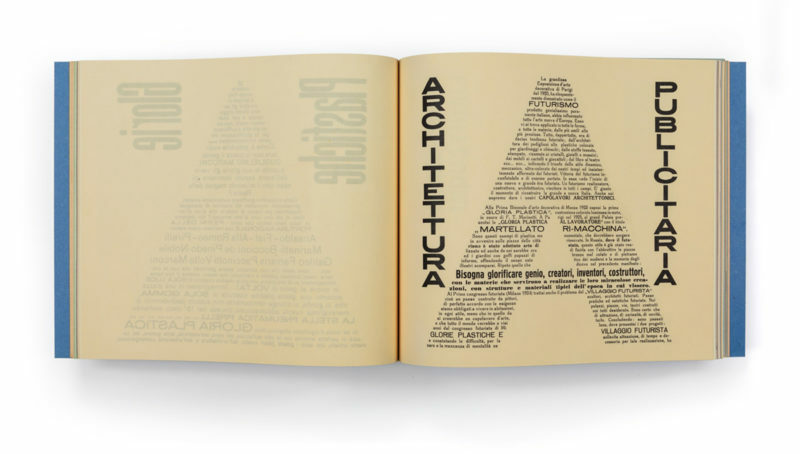 The 2017 facsimile was published by Designers & Books produced in collaboration with the Mart, Museum of modern and contemporary art of Trento and Rovereto, which houses the Depero archives; and the Center for Italian Modern Art (CIMA) in New York, which featured the Bolted Book as a centerpiece of its 2014 inaugural exhibition, devoted to Fortunato Depero. De Volkskrant (Amsterdam) hailed the facsimile as “the most beautiful book published in 2017.” Jane Rodgers Siegel, Rare Book Librarian, Rare Book & Manuscript Library, Columbia University, called it “gorgeous,” and “spot on” as a replica. Like the first printing of the Bolted Book facsimile, the second printing will be an exact copy of the original 1927 Depero Futurista, including its signature binding of bolts and wide variety of colorful and highly tactile paper stocks. As with the first printing, accompanying the second printing facsimile will be a softcover Reader’s Guide featuring English translations of key elements of the book; essays by Depero scholars and curators, including graphic design authority Steven Heller, that examine the book’s design legacy; and a selection of previously unpublished photographs, drawings, and correspondence from the Depero archives at the Mart, Museum of modern and contemporary art of Trento and Rovereto. The Reader’s Guide will also include a special acknowledgments section with the names of the second printing Kickstarter supporters. One of the first pages in Depero Futurista warns that because of its bolts the book is “dangerous” and “cannot be placed alongside other books.” The Kickstarter for the facsimile’s second printing will offer an alternative contemporary solution: a custom-designed wood display stand that allows The Bolted Book to be shown face out on a bookshelf or flat on a table, in a way that prevents damage to neighboring books and to tabletops. Designers & Books is an artisanal publisher focused on art and design books that inspire us to remain true to our creative spirit. 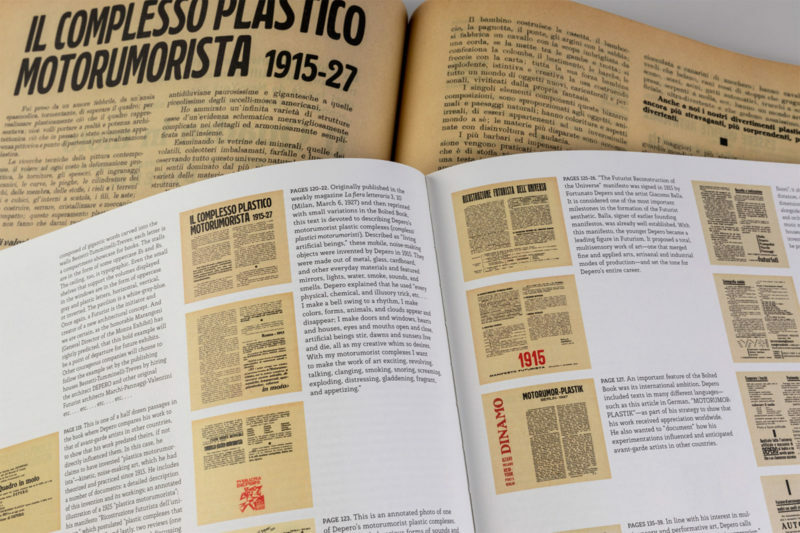 It created the successfully funded Kickstarters for the first printing of the facsimile of Depero Futurista (The Bolted Book) in 2016 (published 2017), and the facsimile of Visual Design in Action by Ladislav Sutnar in 2015, as well as the original publication Seymour Chwast: At War with War in 2016. Designers & Books also maintains a website that advocates for books as important sources of inspiration. All images courtesy of Designers & Books unless otherwise noted.